Stainless Steel is an alloy of Iron with a minimum of 10.5% Chromium which produces a thin layer of oxide on the surface of the steel. This 'passive layer' prevents any further corrosion of the surface. Stainless Steel also contains varying amounts of Carbon, Silicon and Manganese as well as Nickel, Molybdenum and extra Chromium which can be added to impart enhanced formability and increased corrosion resistance. 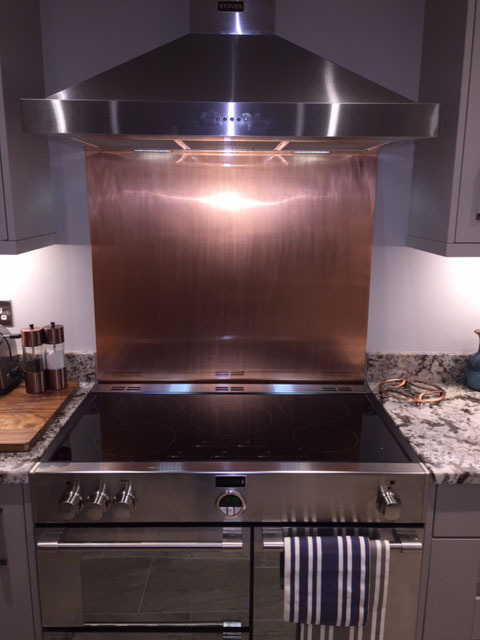 Stainless Steel is ideal for use in normal atmospheric or water based environments and kitchens as it is much more corrosion resistant than ordinary carbon or alloy steels hence it's use in sink units, worktops and splashbacks etc. In more aggressive conditions ( marine or laboratory use etc ) the more basic types of Stainless Steel may corrode so a more higher alloyed Stainless Steel is recommended. Stainless Steel is highly durable but overtime can be scratched and marked forming a 'patina' which becomes a feature of the surface. These marks are purely superficial so the Stainless Steel keeps totally hygienic when cleaned which is why it is used so much in commercial kitchens where hygiene is paramount. Unlike many other manufacturers we predominantly use Austenitic 304 grade Stainless Steel on all our jobs including frames and shelving unless stated otherwise. We do not use Ferritic 430 grade Stainless Steel unless it has been requested as overtime this grade will deteriorate and mark. This lesser grade Stainless Steel also posses magnetic properties so is easy to check whether it has been used by using a magnet. Type 304 grade is not magnetic. We supply our Stainless Steel products in a satin dull polish grained finish which will match most appliances. Whilst we would always recommend the satin finish which hides and blends in any scratches much better, we can also supply a mirror finish if required. Stainless Steel requires regular care and cleaning. You should wash down the surface using water containing a mild detergent or soap and then rinse with clean water and dry with a soft cloth. To thoroughly clean you should polish the surface with a stainless steel polish and a soft cloth. Any discolouration, dirt or limescale deposits should be removed immediately using a mild proprietary cleaner such as 'Cif' in a gentle rubbing motion with the grain of the metal. Follow this by rinsing thoroughly as above with clean water and then dry with a soft cloth. Do not use cleaning agents containing either chlorine or hydrochloric acid and also avoid using course abrasive materials such as harsh scouring pads or wire wool. You should always avoid lengthy contact with rusting objects such as cast iron pans or iron filings, hair dye or fabric bleach as well as most common bleaches, toilet cleaners, acids, concentrated disenfectants, photograph developing liquids and strong alkalies like caustic soda which if left uncleaned can cause pitting to the Stainless Steel surface. If any of these solutions come into contact with the surface you should thoroughly rinse them off as described above. protect the surface of either a granite or wood / laminate worktop. always use a pan stand. you to first have your Stainless Steel afixed to a MDF board to create a flat surface and then stick to the wall as before. If you are covering old worktops or cladding kitchen units with Stainless Steel then again a strong grab adhesive is the favoured method. Aluminium is a soft, durable, lightweight and malleable metal with an appearance ranging from silvery to dull grey. It also has excellent corrosion resistance and being non toxic is used widely with food and pharmaceutical products. Aluminium comes in sheet form, tubes, box sections, angles, channels & round and flat bars. It is used extensively in general fabrication and also for architectural products such as flashings, pressings, cills, soffits & cappings due to it's ease of fabrication and excellent powder coating qualities. Made from a strong grade of Aluminium it has excellent corrosion resistance and is mainly used for protection. Aluminium Treadplate has a decorative and industrial appearance and is very popular with designers. Typical applications include hygenic & slip resistance floor covering, wall and column protection, kick plates, access ramps, stair treads and also vandal protection on shop fronts. Mild Steel is the normal choice for most fabrications where the required finish is to be either primed or painted as whilst it has poor corrosion resistance ( it will rust ), it is also stiff, strong and relatively cheap. It is available in either sheets, angles, round, square and flat bar, channels and tube, as well as also beams, columns and joists for construction purposes. It can also be supplied in galvanised steel sheets where a protective zinc coating has been added to the steel which helps protect it against corrosion making it ideal for outside area and gardens. Zinc is a soft, hardwearing and attractive sheet metal that is traditionally used to create distinctive long lasting architectural building features, roofing, flashings, guttering and finials as well as being widely used in interior design to create rustic charm and character in counters, worktops and splashbacks. Natural zinc is a living material and will develop a light grey patina over time but it's colour can be adjusted by polishing. Copper is a naturally occuring metal which is very corrosion resistant, has natural antibacterial properties and in sheet form is easy to form into complex shapes. Used in kitchens for centuries, it has a diverse range of applications including work surfaces, splashbacks, trims and push/kick plates. Copper is also used architecturally outside or in gardens where it will develop an appealing natural greenish patina which protects the metal from further corrosion.